The recent Singapore school holiday period served up a great opportunity for me to practise what I always preach - in terms of fitness programming and working-out while traveling. 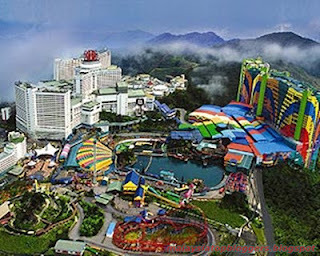 As it is, during the recent June holidays, as part of our "Bi-Annual Family Get-Away" ritual, my wife and I decided to bring the kids over to neighbouring Malaysia - Genting Highlands - for a cool retreat, away from the sweltering heat that had engulfed Singapore for the past few weeks. Though the trip was for less than a week, still I knew I had to get my travel workout routine planned out so as to make the best use of the time available. Faithfully referring to my trustworthy pile of travel fitness notes, I designed and planned a fitness workout program that I felt would be workable under the specific conditions, and could be taken along and performed easily - without any equipment, and without eating too much into our family vacation time. Initially, part of my ambitious plan involved getting out of the Genting Resort area and tackling the winding slopes of Genting Highlands - with Interval Runs, Hill Sprints and other Outdoor Fitness Drills. However, after doing some research on the Internet (which revealed an unfortunate number of fatal accidents along the treacherous Genting stretch) - I decided to ditch my initial plan in favour of something less risky and more "family-friendly". And hence - my plan for a Totally-Indoor Hotel Workout Routine - was hatched. Confidently armed with my travel workout program, backed with my professional knowledge in fitness training, I was prepared to kill two birds with one stone : work my body to the max, while still getting to enjoy some quality time with the family during the vacation. From constantly having to adjust and modify our schedule to cater to the kids' incessant and increasing demands for more adrenaline-pumping rides, activities and other fun-filled stuff at the Genting Theme Park ( and there are many of these, to be quite honest), to having to live up to my promise to do "some" holiday shopping with the wife, as well as other little hiccups that happened along the way (including my workout shoes suddenly breaking-apart with no prior warning) - before I knew it, half the vacation time was gone! Fortunately, instinct (or perhaps an innate fear of de-conditioning ) kicked in, and I had to convince myself to squeeze in a workout no matter what. All-in-all, I managed to squeeze out 3 rounds or 3 full circuits of the above stuff. And guess what?? At the end of it all, I actually felt pretty GOOD - both physically and emotionally! Not only did I get manage to get a Full-Body Workout and a great PUMP all over, I also worked up a good sweat, got my heart rate well up, worked off some travel stress, and flushed my system full with endorphins and other feel-good hormones!!! And more importantly, I got the immense satisfaction of having got my workout done during the trip (although it was still less than what I originally planned)! As my above experiences showed, workouts SHOULD, CAN and ARE entirely possible for anyone contemplating vacation or travels - as long as you have deliberately factored in time for exercise, and are committed enough to see it through. But still, if you are committed to your exercise regime, and disciplined enough to see it through, you are bound to get something done during your trip - Guaranteed! For those who want to know how to get MORE out of their vacations and travels, and would like to learn how to program their own fitness regime or exercise routine while on the roads, please feel free to check out our Travel Fitness Services. And guess what? Your vacations and travels are also going to be much more meaningful, more productive and more satisfying than ever before.